Calm Sky Adventures LLC is a small, family owned, hot air balloon ride company serving the Oshkosh, Wisconsin area. Calm Sky Adventures LLC was started in 2017 by us, Brenda and Mike Beck, to share our love for ballooning with others! Brenda handles the operations side of the business and Mike pilots the balloon. 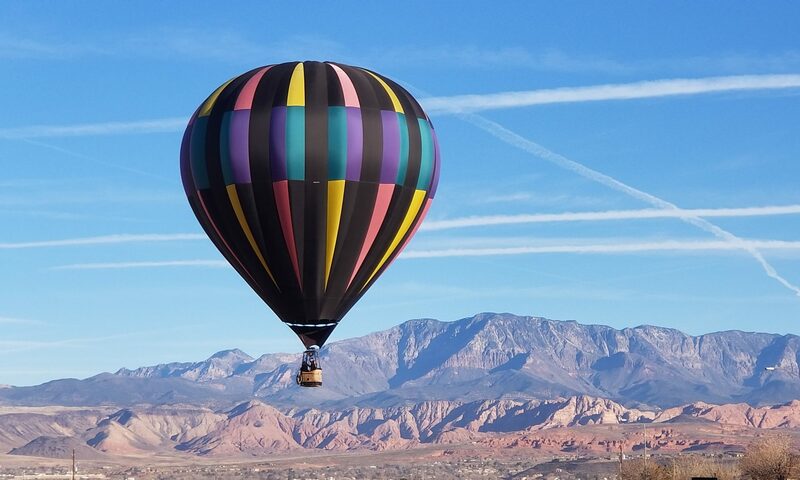 Brenda has always loved seeing hot air balloons and always wanted to go for a ride in one. Mike surprised her with a ride as an anniversary gift and both immediately fell in love with ballooning. After some research and talking with other balloonists, we decided to buy our own balloon and start a business to share our joy of ballooning with others! Our balloon, “Stratophoria”, is a colorful 77,000 cubic foot balloon and was manufactured by Firefly Balloons in North Carolina. The balloon is made up of a rattan wicker basket and a polyester envelope. A burner uses propane to produce millions of BTU’s, heating the air inside the envelope allowing the balloon to fly. Our balloon’s name, “Stratophoria” is a mashup of the words Stratosphere and Euphoria. Stratosphere – A layer of stable atmosphere, that lacks turbulence and is almost completely free of clouds and weather. Euphoria – A feeling or state of intense excitement and happiness. Mike has been enthralled with aviation since childhood. Working aviation related jobs led to him getting his pilots license in 2004 and even building his own airplane. Mike has flown hundreds of hours in many types of different aircraft over the years. He enjoys continually adding new skills and ratings to his flying resume. Mike holds a commercial lighter than air, hot air balloon certification, as well as multiple other FAA certifications, ratings and endorsements for fixed wing and unmanned aircraft. Without our ground crew we wouldn’t fly! Our crew consists of family, friends and other people who want to experience the fun and excitement the ballooning world offers! If you are interested in crewing for us please check out our crewing opportunities page for more information!